Burglary is on the rise in the UK, according to reformed criminal and BBC’s ‘Beat The Burglar’ expert Michael Fraser - and students are easy targets due to having lots of valuables and a relaxed attitude to security. Michael is working with top insurance companies advising them on new challenges, including the risks of social media. Despite police figures showing reported burglaries going down year-on-year, Michael tells us burglary is actually on the increase, especially in student areas, due to the recession. Many students don’t bother getting insurance which makes burglary a big financial blow and could affect their chances of continuing their studies. According the MET Police most burglaries tend to be opportunistic, rather than planned. What advice would you give to students who are moving into a new home? “Identify your belongings by writing down serial numbers and descriptions for all your valuables. SmartWater your valuables (which you can do for free) and take photos of your room so you can identify what has been taken if there is a burglary. "Make sure you get to know your housemates; thieves take advantage of the fact people don’t know each other, especially in large accommodation blocks. For those living in houses, it’s a good idea to get a neighbourhood watch sticker as it deters burglars. Ask the landlord to fit a second BS (British Standard) Approved lock to the front and back doors and always ensure your individual rooms are locked. 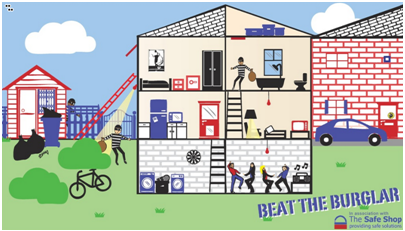 The Safe Shop has created an infographic to show you how to keep your house safe. View it here.